Looking for an Amalfi Coast Cooking Vacation ? You will be cooking, singing, dancing, dining, wining, relaxing, having fun throughout your vacation. During the week-long trip, you will learn some wonderful fresh recipes and techniques, and also make friends for life. 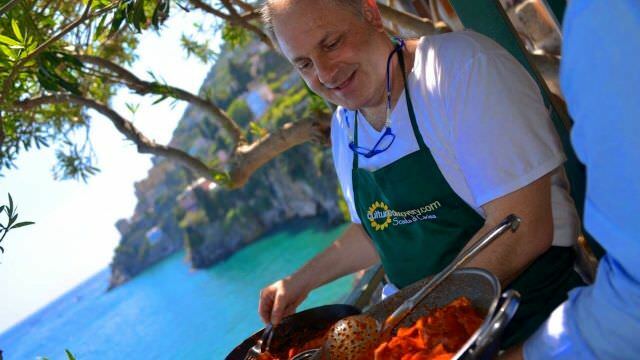 It’s the perfect way of learning to cook delicious food while discovering the provincial culture and cuisine on an Amalfi Coast cooking vacation. Learn to cook with 100% hands on cooking classes. Cooking lessons with Local Home Cooks. All Inclusive cooking vacation with included excursions each day whenever we are out of the kitchen. English speaking, Native Italian chefs and hosts. Small groups who speedily become dear friends. Organic farm-to-table ingredients used in all cooking classes, often the local catch of the day. Small, hometown trattorias that are the best farm-to-table Italian food whenever we are eating out. All transportation by private boats or minibus. We treat each guest like they are our own family. They discover the true coastal life so few people truly experience. They live the passion for local cooking, food and wine, and regional cuisine of the Amalfi Coast and Naples, which is at the heart of life in Italy. 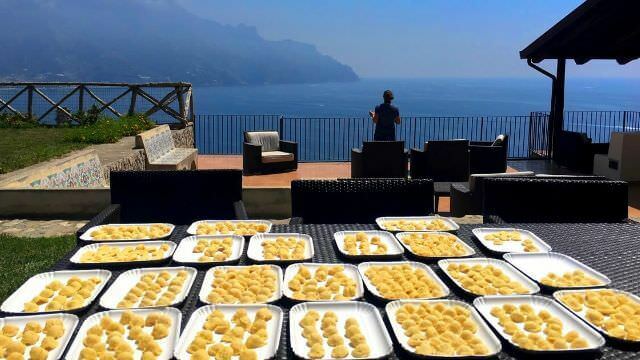 The cooking vacations in Amalfi offer the enchanting experience of provincial coastal Italian culture like no other vacation. They are personal and intimate, so we all become dear friends. We live among the locals, shop with the villagers, explore like the Italians. We see the famous sights so many want to see, but we also spend time getting to know the true local life in the less touristy towns of the Amalfi Coast. 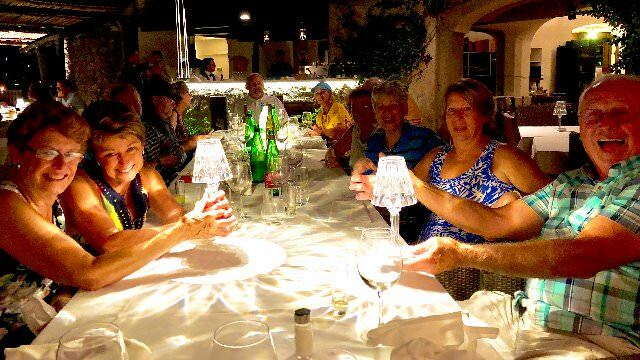 Our vacations offer four full Italian cooking classes during the week, focusing on authentic regional cuisine, which are all family recipes of our wonderful hosts. When we are away from the kitchen, we always have something exciting and fun happening. 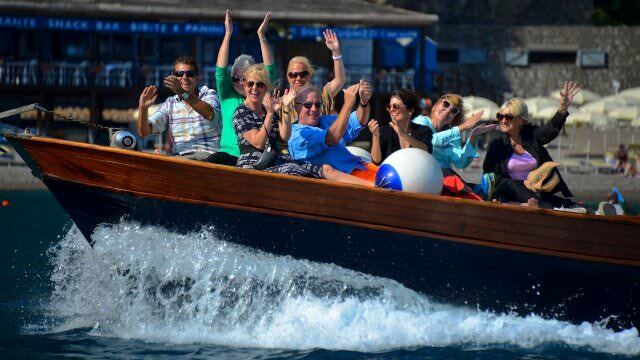 We visit Positano with a Prosecco Toast on our Boats at sunset overlooking the majestic coast. 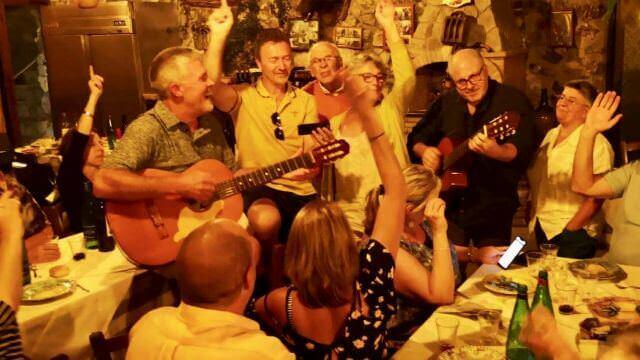 We have a private beach BBQ with local catch of the day, we spend a day at the island of Capri, with our private boats, we make fresh mozzarella from scratch with a local cheesemaker, and we party live music, singing and dancing with our new Italian family. We also go off the beaten path and introduce guests to our favorite hidden gems most tourists never experience, suh as the smaller, less visited towns along the coat, and even a wonderful family winery in the hills. These excursions are never about simply visiting a place. There is almost always a unique connection wherever we go. The cheesemaker and the winemakers are dear friends. 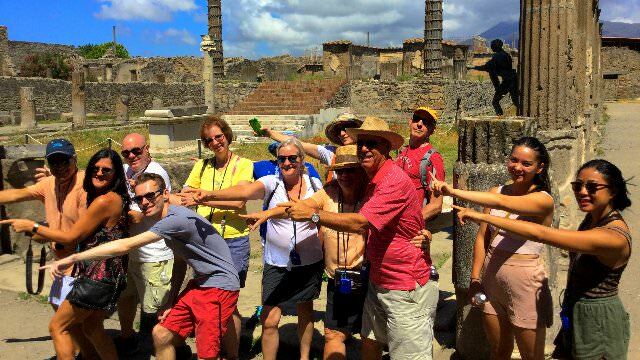 Wherever we go, there is always a connection with the people, and at the villa, everyone you will encounter is a family, that will quickly become your own extended family away from home. 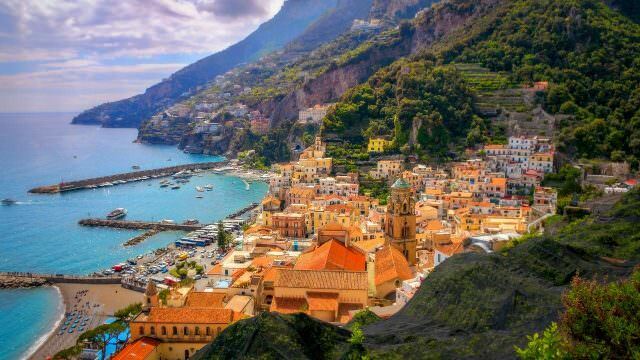 There is always a special reason for wherever we are going, and it always connects with the lifestyle on the Amalfi Coast, friends and family, and the culinary delicacies of this beautiful region of Italy. 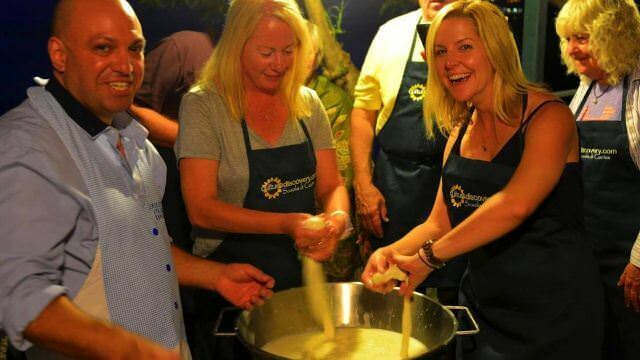 Our Amalfi Coast Cooking Vacations feature four half-day cooking classes. They are not demonstrations. They are 100% hands on cooking classes. So you will roll up your sleeves and get wrist deep in making everything fresh, from scratch. For those wishing to spend more time sipping wine and eating Italian food, you can participate in the cooking lessons to whatever extent your heart desires. Swim in the pool at the villa, take in the sun our the stunning views, Relax in the beautiful settings, take a stroll among the lemon groves, or go into Amalfi. Whether you are cooking or not, the time we spend during the cooking classes are always a highlight. On our Culinary Vacations on the Amalfi Coast, we make Caponata, 'Ndunderi and Cocce Pasta, Braciole, Sausage and Pork Rib Ragu, Potatoes Gateau, Baba al Rhum, Pasta Fazul, Eggplant Involtini, Fresh Mozzarella from scratch, Custard Cream Crostata, Home-Made Limoncello with Amalfi Lemons, and a highlight of the week is Pizza Night, when we learn to make real Neapolitan Pizza in the wood-fired oven at the villa! Even the meals that are not part of our cooking classes are uniquely special. After all, the cuisine of Southern Italy is truly unique and different from much of the Italian food in other regions. Whenever possible, we select small, family-run trattorias where the ingredients came right out of their garden, or the fish was just caught hours ago by nonno, while nonna is cooking in the kitchen. These are the places that are known to be the best in any of the coastal towns. The wine is always flowing during lunch and dinner, and we take pride in making sure that we're pairing the right dish with one of the wonderful local wines. There are many websites offering cooking and culinary vacations on the Amalfi Coast, and there are so many wonderful offerings. But each is different in a variety of ways. First, most of the websites you discover are actually travel agencies that are offering a catalog of Italian cooking vacations that they are reselling. Usually, they have no idea what the experience will even be like. In fact, often you may not realize it, but they are reselling our vacation. Culture Discovery is not an agency. When you are with us, you are with us. You will likely be meeting the people you email or speak with. If you take all of those out, you only remain with a few. Many of those are actually hotels or restaurants that learned they could offer cooking vacations to fill their rooms or say their restaurant is a cooking school to fill tables. This is especially true of the Amalfi Coast, as there are so many hotels trying to fill rooms. In other words, the cooking vacation is mostly to get you to buy their primary services. In fact, one of the best known companies that offers cooking vacations on the Amalfi Coast is just an "aggregator" of services. In other words, they arrange your hotel, piece together cooking classes offered by various restaurants, and as for excursions, they hae a driver take you there and drop you off. There is no soul, and no overall connection made. Cooking Vacations in Italy is how Culture Discovery started in 2006, and quickly grew to be the largest directly owned company of its kind in Italy. But there are a few others that are like this as well, and we really stand out in the details. What makes us so unique is that we look at our vacations like finely orchestrated concert from the moment you arrive, until the moment you leave. While others do cooking classes, provide accommodations, and may offer some excursions, we look at each vacation as a full experience. This is why our weeks are all-inclusive. We believe that the full experience is more about the Italian culture of family and friendship than anything else. So we start with that. Our goal is not just offer a cooking vacation or cooking school, with a few excursions here and there. It is to give you a full experience, so that when you leave, you will have made new life-long friends, and you will have experienced many things you never could have otherwise. You will have a new family. To do this, we make sure all of our meals outside of cooking classes are in small, family-run trattorias that are dear friends. Whatever we do, wherever we go, everything is connected and all about relationships. In fact, you will see that we spend more time introducing you to the cheesemaker than the cheese. Our excursions are not "history tours", but they are excursions that bring you into the local coastal living. And our cooking classes are all more like a group of friends and family cooking together for. party, than an academic class. All of this weaves together into a dream experience that gives our guests a true sense of belonging that lasts long after the vacation itself, and this is why so many of our guests come back over and over... because they have truly become dear friends and extended family. It is not a marketing line, it is actually what we do, and why we love doing this. Just look at our Facebook Page or our Facebook Group for alumni, and it is clear that our team and our guests are a big family of friends.